Jesus tells His followers to abide in Him. Abide, which can also mean stay or remain, has the idea that Jesus wants believers to rest in Him. How is this done practically in a world where we are on-the-go with deadlines to meet, families to care for, and things to do? Yet, Jesus promises when His followers rest in Him, they bear much fruit because apart from Him we can do nothing. His goal is for His followers to be completely dependent on Him in every aspect of life. Is that your goal, too? 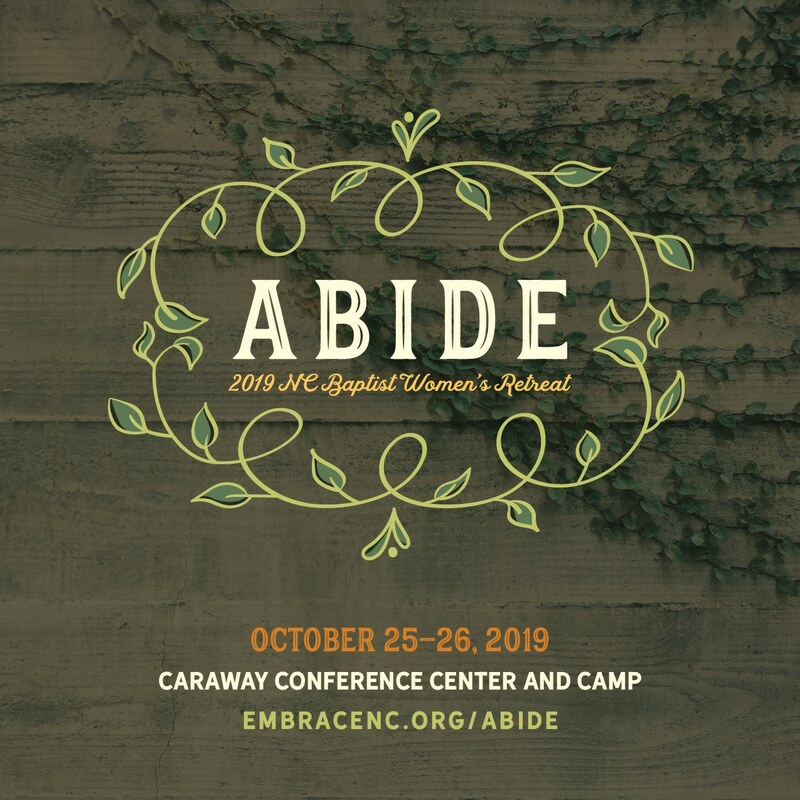 Registration for the 2019 NC Baptist Women’s Retreat will open May 31. *Lodging is first-come, first-serve via registration and is limited in the Conference Center. *Please note: Registration is first-come, first-serve and is transferable for this event, but non-refundable. **Double-room, double-occupancy means two beds for two ladies in the room. Those who select this option must already have a roommate and register and pay at the same time. We do not find roommates for participants and no more than two ladies are allowed in one room. Betsy Bolick lives in the mountains of North Carolina and is thrilled to serve at Perkinsville Baptist Church as the Minister to Women. She received a degree in Religion with a specialization in Women’s Ministry from Liberty University and a Master’s in Church Leadership and Ethics from John Brown University. She is currently enrolled at Gordon Conwell Theological Seminary in the Master of Arts in Christian Counseling program. She is the Founder and Director of Small Enough Ministries. Betsy is passionate about reaching all women for Jesus Christ. She desires to make disciples and to fulfill the mission Christ has called her to fulfill for His glory. 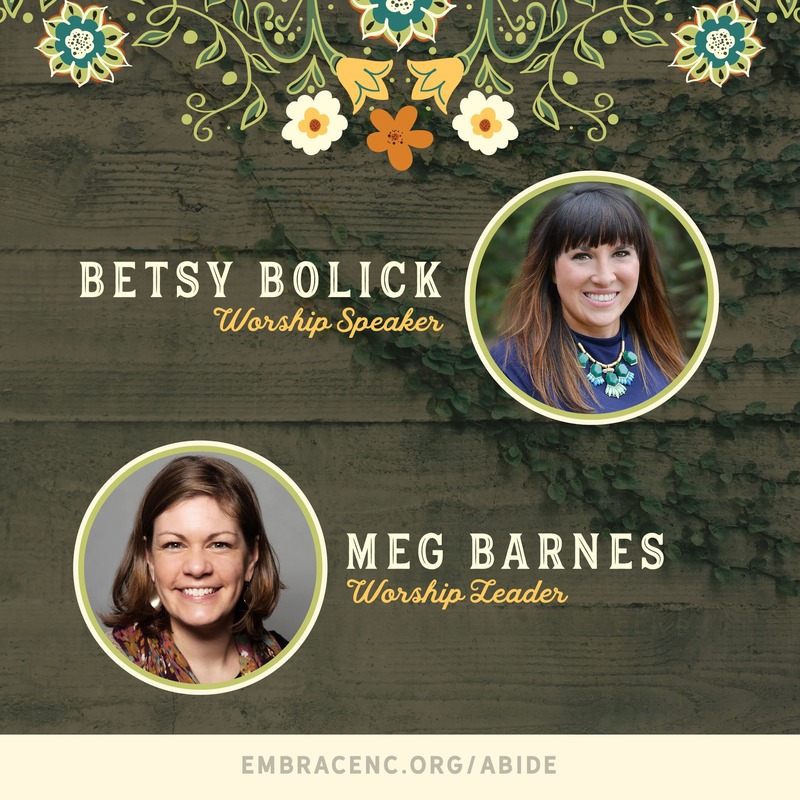 Meg Barnes serves in the worship ministry at Providence Baptist Church in Raleigh, where her husband, Andrew, serves on staff as director of communications. A native of Wilmington, Del., Meg graduated from James Madison University and works in marketing for a civil engineering firm. Having committed her life to Jesus at a young age, Meg has a deeply rooted love for the Lord and His church and fervently desires for all people to “grow in the grace and knowledge of our Lord and Savior Jesus Christ” (2 Peter 3:18) through His Word and discipleship relationships. John begins his Gospel with these words, “In the beginning was the Word, and the Word was with God, and the Word was God” (John 1:1). John continues by explaining that Jesus is the Word made flesh and He made His dwelling among us and He is full of grace and truth (1:14). His Word is truth and He longs for His followers to trust in His Word as they trust in Him. At times, however, it can seem overwhelming to study the Word of God. This breakout session will help attendees with tools for study and interpretation so that abiding in Christ through His Word is a daily reality. Abiding in the Vine: What is Sabbath Rest? Jesus told His followers that the Sabbath was made for man, not man for the Sabbath and that He is Lord of the Sabbath (Mark 2:27-28). In the Old Testament when the Lord gave man the Sabbath, it had two purposes: trust in the Lord for His provision and man’s physical rest. Sabbath is a spiritual discipline that is necessary, but often neglected. This breakout session will provide a clear understanding of how Scripture defines the Sabbath and ways that a Sabbath rest can be implemented to grow in faith and renew us physically. Many books, Instagrammers and social media sensations spread the word, “Set your goals,” “You do you,” and “If you want it, go for it.” However, this message focuses on the individual making it happen instead of what Jesus says – Abide in Him and die to self. This breakout session will help attendees understand how to seek the will of the Lord, why obedience is important and how to obey the Lord, and why this provides greater satisfaction than doing our own thing. As Jesus was having the conversation with His disciples recorded in John 15, they are walking to the Garden of Gethsemane. Jesus modeled what it means to be in constant conversation with His Father. As the Lord went about His day, He was talking with God. This is exactly what He desires of His followers today. How do we seek the Lord when we are driving, cooking dinner, taking care of families or in a meeting with co-workers? This breakout session will help attendees develop ways to pray without ceasing and seeking the Father as they enjoy each new day. Throughout Scripture, living in community was a necessity for God’s people. The Israelites lived and served in groups of people, and in the New Testament it is recorded, “And the congregation of those who believed were of one heart and soul; and not one of them claimed that anything belonging to him was his own, but all things were common property to them” (Acts 4:12) and the people day by day were with one mind and taking their meals together (Acts 2:42-47). As a result, they were bearing fruit as people were coming to faith in Christ. What does this look like in our modern context? Why is biblical community important to the life of the believer and the church? This breakout session will examine the biblical basis of community and provide practical ideas for living in community. In John 15, Jesus tells His disciples He is the Vine and His followers are the branches and if they abide in Him, they will bear much fruit. What is the fruit He is speaking of and how do His disciples produce it? This breakout session will examine what the fruit of the Vine is and what it is not. This session will also provide suggestions that will help a follower of Christ grow the fruit Jesus is speaking of as they choose to abide in Him daily. In John 15, Jesus says, “I AM the Vine.” In the remainder of John’s gospel, Jesus says, “I AM” the Bread of Life; the Light of the World; the Gate (Door); the Good Shepherd; the Resurrection and Life; and the Way, the Truth and the Life. Essentially, Jesus is telling His followers, “I AM I AM.” These theological truths impact our lives every day as we seek to walk with the Lord, but how? This breakout session will provide an understanding of the theology of Jesus’ words and a practical application of these words for every believer – whether or not you have had formal theological training. The storms of life will come – it is inevitable as we live in a broken world. For each person this might look differently, but Christ tells His followers to abide in Him, even as the storm rages. Sometimes this seems much easier said than done. This breakout session, led by a cancer survivor, will help attendees understand how to make practical application of God’s Word when hard situations happen in our lives, as well as what it looks like to rest and trust the Lord through difficult circumstances. In one of his last letters to his son in the faith, Timothy, the apostle Paul commended Timothy’s grandmother, Lois, and mother, Eunice, for the faith in Christ they firmly held and passed on to Timothy. Jesus’ desire is for families to invest the things of God into their children and disciple them. This breakout session will provide an understanding of the biblical mandate of why this important and helpful suggestions for ways to begin this process with your own children and grandchildren. Society encourages women to be independent and to do it themselves. In the eyes of culture, those who do this are viewed as successful and worthy of notoriety and emulation. Yet, Jesus says apart from Him we can do nothing (John 15:5). Jesus says He is the Vine and His followers are the branches and if they abide, or rest, in Him they will bear fruit. His followers must be dependent on Him. This breakout session will focus on what abiding is and what it is not and practical suggestions for dependent on the Lord when the world tells them otherwise. One of the things that Jesus tells His disciples in the “abide” passage is that He loves His disciples as the Father has loved Him. His disciples are to love their fellow disciples this way, but they are also to love the world with the love that can only come from Christ. Sometimes it can be difficult to love our neighbors, even when we know we are commanded to do so. How can we do this well so we might have opportunities to share the gospel with them? This breakout session will focus on what Jesus says about abiding in His love, how His followers do this, and how His followers can rest in Him in effort to share the love of Christ with their neighbors. Paul instructed Timothy to take the things he learned from Paul, and entrust them to others who would then teach those same precepts of the Lord to others (II Timothy 2:2). There is not a biological blood line in the verse, but four generations of believers are represented. We, too, are to produce generations of the vine as we teach others the things of God, who will then teach others, who will continue the investment of God’s Word with others. This breakout session will help you identify women around you with whom you can begin this discipling process as you teach and model the things of God for them. When Jesus speaks the words of John 15 to His disciples, it is the night before He is crucified and after He and His disciples have shared the Passover meal together. All four gospels provide an account of this night and John records the words of the Vine Life. This breakout session will provide an understanding of all the accounts of that evening in chronological form to provide the greater context of Jesus’ words in John 15.